﻿ Fleetwood's Tap Room - Ohio. Find It Here. Fleetwood's Tap Room, located in downtown Toledo across the street from the Mud Hens ballpark, is a craft beer lover's paradise. There are 48 beers on tap at any give time, as well as signature cocktails, bourbons, and whiskeys.Fleetwood's is proud to serve pizza and appetizers that are prepared to pair perfectly with the beers.Directly adjacent to Fleetwood's is Hensville Park, an event space that hosts concerts, festivals, beer tastings, and other events. 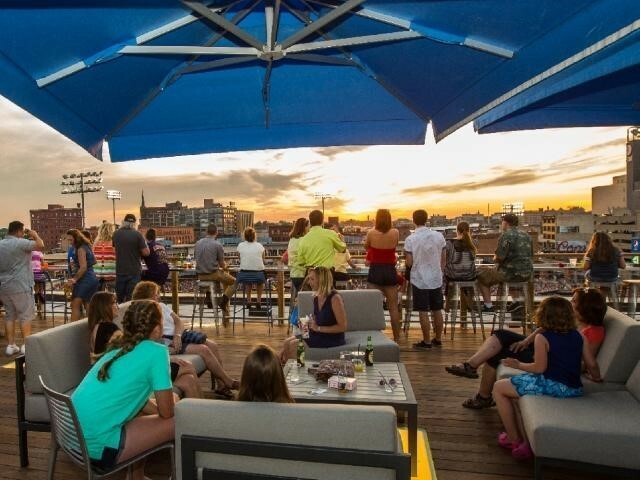 The rooftop above Fleetwood's Tap Room boasts incredible views of the ballpark, downtown Toledo skyline, and the Maumee River.